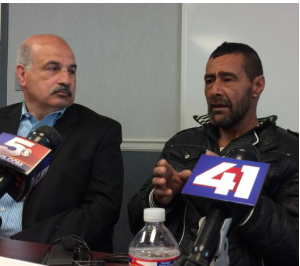 Syrian refugee Ahmad al-Abboud (right) tells his story through interpreter Fariz Turkmani at a press conference in Kansas City. TOPEKA – Gov. Sam Brownback announced Kansas’ withdrawal from the federal refugee resettlement program last month, but agencies within the state will continue to help. “Not all states participate in the administration of the refugee resettlement program, and refugee resettlement will continue in Kansas, coordinated by non-profit organizations,” said Mark Weber, a spokesman for the U.S. Office of Refugee Resettlement (ORR) in Washington, D.C.
Lua Kamal Yuille, a University of Kansas associate law professor, agreed Brownback’s order wouldn’t end refugee resettlement in Kansas since many private and nonprofit organizations conduct programs on their own. The money for those services simply passed through the state of Kansas on its way to the organizations. “All of the actual services – the English classes, the psychological services – all of that was already being provided by nonprofit organizations,” Yuille said. Sizable populations of refugees live in Kansas cities, including Wichita, Garden City, Dodge City and Liberal, according to University of Kansas professor Don Stull, who has conducted research on immigration to southwestern Kansas. According to the ORR, the state of Kansas served 741 refugees through the state-administered resettlement program in 2015. Eight of them were Syrian. Garden City, Dodge City and Liberal are secondary rather than primary resettlement locations, Stull said. That means refugees seeking to move there do so of their own volition, rather than being directed there by federal or state agencies. Many refugees in those locations hail from Somalia and Burma, as well as Central American countries. Many are attracted by employment in the region’s meat packing plants. “They’re coming to find work, and when they find work, they’re gainfully employed,” Stull said. The Archdiocese of Kansas City in Kansas is reviewing the impact of the state’s withdrawal from the federal government’s refugee relocation program on its own refugee resettlement work, Catholic Charities of Northeast Kansas said in a statement. President Barack Obama’s administration planned to welcome 85,000 refugees during the 2016 fiscal year, 10,000 of them from Syria. The United Nations has registered 4.8 million Syrian war refugees as of April 25. Brownback said he didn’t have confidence in the vetting process for refugees fleeing the Syrian civil war. “Because the federal government has failed to provide adequate assurances regarding refugees it is settling in Kansas, we have no option but to end our cooperation with and participation in the federal refugee resettlement program,” Brownback said in a statement. The Refugee Act, enacted by the federal government in 1980, requires states to provide assistance to refugees without discrimination. Yuille says Brownback’s order prevents Kansas from being charged with discrimination by federal agencies. Kansas’ pullout from the federal program will cost the state about $1.6 million in grant money, according to the ORR. The grant money goes toward the administration of state refugee resettlement programs.